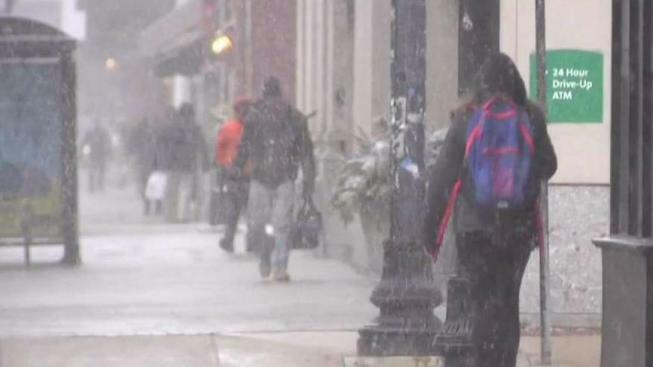 The snow is falling in Manchester, New Hampshire, during the second nor'easter in as many weeks. New Hampshire is predicted to get up to a foot of snow in the latest nor'easter Wednesday into Thursday morning. "It's New England," said Darren Johnson of Pembroke. "It's what we do." The consensus among people in Manchester was that New Englanders stay prepared for snow on any given day. "It's 70 degrees one day," said Jared Breault. "A foot of snow the next. That's how we roll." "I have gasoline in my generators," said Johnson. "I hunker down until it's over with," said Joanne Ouimette. The storm is expected to expected to pass Thursday morning. Lisa Leary has a 30-minute drive from Massachusetts to New Hampshire. "I brought an extra set of clothes in case I had to stay over," she said. Hope Wooten was in Manchester from Vermont for a conference. Wooten said the snow was more than she bargained for. "The eight-to-12 inches is a little intimidating," Wooten said. For many residents, the snow was far less intimidating. "We have to work and things go on, right?" said Leary. "When it's over with, you go out and snow blow your way out of there," said Ouimette. One man said he's already looking past the snow to the spring. "It's new England, I'm just waiting for opening day," he said.